Welcome back to another week of Fantasy basketball action. This week, Ex-Cleveland Coach David Blatt’s questionable firing still remains the talk of locker rooms — you have to wonder what the odds of that happening were on sports betting sites; Blake Griffin got into a scuffle with the team’s assistant equipment manager (Blake insisted he carried his own ball); and Chris Bosh, a power forward — declared his interest in this year’s All-Star Three-Point Shootout (Kevin Love and Dirk Nowitzki got a shot, right?). 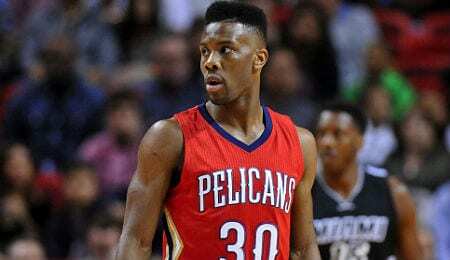 Norris Cole, PG, New Orleans Pelicans (ESPN: 13.4 per cent; CBS: 34 per cent): Cole played stellar in the absence of teammate Tyreke Evans (knee) with 17 points, 10 assists and seven boards in a win against the Kings Thursday. Injuries always open opportunity. So if you’re looking for a chance at Fantasy redemption next week, give Cole (who has shown an ability to drive to the hoop and finish — see video below) a look while Evans sits. Langston Galloway, SG, New York Knicks (ESPN: 10 per cent; CBS: 25 per cent): You have to appreciate the discovery of stat sheet stuffers like Galloway, because it really comes in handy in Fantasy league formats. He did just that in not just one, not two, but in his last three games. Galloway’s most efficient performance came Thursday against the Thunder — resulting in 23 points, seven boards, five assists, three steals and an assist. With Jose Calderon (groin) out indefinitely, Galloway will try to continue to provide a nice all-around game. Josh Smith, PF, Houston Rockets (ESPN: 20 per cent; CBS: 40 per cent): Although Smith could serve up some frustration, he could serve up some Fantasy help as well. He’s an all around box score-filler that plays between the cracks (get your mind out of the gutter). J-Snoov’s best game this week came in a Sunday win against the Mavericks (16 points, three rebounds, two assists, two blocks, two steals). If he can continue to at least occasionally stuff the stat sheet, he’s worth owning in deep league formats. Nene Hilario, Washington Wizards (ESPN: 7.3 per cent; CBS: 16 per cent): Nene — the man whose first name is also his surname on his CBS Sports profile, has been trying to chime in some of his own magic lately for his team of Wizards. Seeing steady and small bumps in minutes over the last four games, he’s flirted with 30 minutes and dropped 15 points, seven boards and two blocks Friday in a loss to the Nuggets. If Nene could just access that aggressive offensive tenacity he has shown in prior seasons, it might result in extra minutes and higher production. For now, he’s a decent deep league stasher. Boban Marjanovic, San Antonio Spurs (ESPN: 2.6 per cent; CBS: 8 per cent): The Spurs always save a trick up their sleeves every NBA season; whether it’s acquiring pro talent like LaMarcus Aldridge this season or signing international players like they did with Marjanovic last summer. Marjanovic, the new monster-on-the-block (standing 7’3”) notched his second career double-double with 13 points and 10 boards Wednesday versus the Rockets. Where San Antonio find these guys doesn’t matter. All that matters is you finding Marjanovic on the waiver wire if you’re in need of an instant points and boards combo boost. Now it’s your turn. Let us know in the comments below who your favourite Fantasy basketball waiver wire pick of the week is. Did you know that RotoRob.com now has its own app? Download it here! Buy the 2016 Fantasy Baseball Guide online, use promo code RotoRob and save yourself a buck. Do it. Do it now. Here, I am going to rank the top 10 as I see them, leaving out their probable or possible NBA teams because until the May 19th Draft Lottery, we don’t know who is picking where. NBA Today: Break Up the Clippers!